Miklós Boskovits (1935–2011), “Bartolomeo Bulgarini/Saint Catherine of Alexandria/c. 1335/1340,” Italian Paintings of the Thirteenth and Fourteenth Centuries, NGA Online Editions, https://purl.org/nga/collection/artobject/12118 (accessed April 23, 2019). The inscription around the elaborate gold clasp holding her cloak gives her name, but 14th-century viewers would have immediately recognized Saint Catherine of Alexandria by the book she holds and the spiked wheel before her. Legends of the fourth-century Egyptian martyr made her one of the most popular saints of the Middle Ages. A beautiful girl from a royal family, she was baptized following a dream in which the infant Jesus gave her a ring. As the bride of Christ, she rejected a temporal marriage to the Roman emperor Maxentius and protested his persecution of Christians. When famous philosophers were sent to convince her of the errors of her faith, she confounded them with her knowledge, but she was still sentenced to be torn apart between spiked wheels. When the moment came, miraculously, the wheels burst into flames, but she was beheaded anyway. Catherine was considered an especially potent intercessor for human prayers, protector of the dying, and patron of students. This painting was once part of an altarpiece that stood in the church of San Cerbone, in the Tuscan town of Lucca (see Reconstruction). It is the work of Bartolomeo Bulgarini, one of the most renowned painters in mid-14th century Siena, less than one hundred miles from Lucca, where other panels from this altarpiece survive. His style reflects two great Sienese artists of the earlier generation: the decorative brilliance of Duccio di Buoninsegna (Sienese, c. 1250/1255 - 1318/1319) and the simple, heavier figures and tender humanity of Pietro Lorenzetti (Sienese, active 1306 - 1345). Raffaele Bruno, Roma: Pinacoteca capitolina (Bologna, 1978), 3. The panel of Saint Bartholomew (inv. no. 345) measures 75 x 42 cm, and that of Mary Magdalene (inv. no. 346) 73 x 41 cm. The two paintings entered the Capitoline collection, Rome, in 1936. In 1706 Antonio de Brandeglio described the paintings in question, together with the panel now in the National Gallery of Art, as extant in the chapel of the Madonna in the church of San Cerbone in Lucca. But when Michele Ridolfi visited the church in 1845, he found only the central image of the Madonna in the chapel and that of Saint John in the sacristy, while all trace of the other panels had already been lost. They had perhaps been separated and dispersed presumably after 1806, following the Napoleonic suppression of the religious orders. Bulgarini, in his triptych representing the Crucifixion at the center and half-length figures of female saints in the laterals (no. 54 in the Pinacoteca of Siena), surmounted the panels of the main register (with a pointed arch defining the painted area and ornamental decoration in the spandrels) with triangular-shaped gable panels filled with half-length figures of saints. Cf. Piero Torriti, La Pinacoteca Nazionale di Siena, vol. 1, I dipinti dal XII al XV secolo (Genoa, 1977), 136. It should be said, however, that, as may be observed from the pose of the saints in the lateral panels, this complex must originally have been a five-part altarpiece. Since it has been truncated below, the main register likely consisted of full-length figures. A complex very similar to the San Cerbone polyptych, apart from that now in the Berenson Library at Villa I Tatti, the Harvard University Center for Italian Renaissance Studies, Florence, must have been that of which only the centerpiece now survives, namely the Madonna and Child in the Museo Diocesano at Pienza. See Franco Russoli and Nicky Mariano, The Berenson Collection, trans. Frances Alexander and Sidney Alexander, Edizioni Beatrice d’Este (Milan, 1964), xvii; and Laura Martini, ed., Museo diocesano di Pienza, Musei senesi (Siena, 1998), 29 – ​31. Only in his late phase, it seems, did Bartolomeo adopt the solution of paired saints in the upper register of altarpieces: an example of this type is the fragment now in the Lehman collection in the Metropolitan Museum of Art in New York. Cf. John Pope-­Hennessy and Laurence B. Kanter, The Robert Lehman Collection, vol. 1, Italian Paintings (New York, 1987), 16 – ​17. See Millard Meiss, “Bartolommeo Bulgarini altrimenti detto ‘Ugolino Lorenzetti?,’” Rivista d’arte 18 (1936): 113 – ​136; and Elisabeth H. Beatson, Norman E. Muller, and Judith B. Steinhoff, “The St. Victor Altarpiece in Siena Cathedral: A Reconstruction,” The Art Bulletin 68 (1986): 610 – ​631, where for the first time a painting attributed to both “Ugolini Lorenzetti” and to the Ovile Master — ​​the Nativity in the Fogg Art Museum in Cambridge, Massachusetts — ​​was identified as a documented work by Bartolomeo Bulgarini. The following biccherna panels can be attributed to Bulgarini: that in the Kunstgewerbemuseum in Berlin (K. 9222), dated 1329 – ​1330; those in the Bibliothèque Nationale in Paris (nos. 1669 – ​1670), dated respectively 1339 – ​1340 and 1345 – ​1346; that in a private collection in Geneva, dated 1349 – ​1350; and that in the Archivio di Stato in Siena (no. Bicch. 28), dated 1352 – ​1353. See, respectively, Miklós Boskovits, ed., Frühe italienische Malerei: Gemälde­galerie Berlin, Katalog der Gemälde, trans. Erich Schleier (Berlin, 1988), 180 – ​181; L’Art gothique siennois: Enluminure, peinture, orfèvrerie, sculpture (Florence, 1983), 198 – ​200; Il gotico a Siena: Miniature, pitture, oreficerie, oggetti d’arte (Florence, 1982), 251 – ​252. Piero Torriti, La Pinacoteca Nazionale di Siena, vol. 1, I dipinti dal XII al XV secolo (Genoa, 1977), 134–135 (without inventory number). In his first attempt to reconstruct the chronology of the artist’s catalog, Millard Meiss (1931) placed the San Cerbone polyptych among the master’s earliest works, close to 1330. Fern Rusk Shapley (1966, 1979) proposed a slightly later date of c. 1335, a dating that Antonio Caleca accepted (1981, 1986). Judith De Botton (1983) proposed 1340 – ​1350, Miklós Boskovits (1990) c. 1340, Judith Steinhoff-­Morrison (1990, 1993, 1996) the mid-1340s, Erling Skaug (1994) c. 1339 – ​1348, and Angelo Tartuferi (1998) c. 1340. See Millard Meiss, “Ugolino Lorenzetti,” The Art Bulletin 13 (1931): 376 – ​397; Fern Rusk Shapley, Paintings from the Samuel H. Kress Collection: Italian Schools, XIII–XV Century (London, 1966), 54; Fern Rusk Shapley, Catalogue of the Italian Paintings, 2 vols. (Washington, DC, 1979), 1:270 – ​271; Antonio Caleca, in Il secolo di Castruccio: Fonti e documenti di storia lucchese, ed. Clara Baracchini (Lucca, 1983), 199; Antonio Caleca, “Pittura del Duecento e del Trecento a Pisa e a Lucca,” in La Pittura in Italia: Il Duecento e il Trecento, ed. Enrico Castelnuovo, 2 vols. (Milan, 1986), 1:254; Judith De Botton, in L’Art gothique siennois: Enluminure, peinture, orfèvrerie, sculpture (Florence, 1983), 242; Miklós Boskovits and Serena Padovani, The Thyssen-­Bornemisza Collection: Early Italian Painting 1290 – ​1470 (London, 1990), 36, 37 n.13; Judith Steinhoff-­Morrison, Bartolomeo Bulgarini and Sienese Painting of the Mid-Fourteenth Century, 2 vols. (PhD diss., Princeton University, 1990), 1:192; Judith Steinhoff, “A Trecento Altarpiece Rediscovered: Bartolommeo Bulgarini’s Polyptych for San Gimignano,” Zeitschrift für Kunstgeschichte 56 (1993): 107; Judith Steinhoff-­Morrison, “Bulgarini, Bartolomeo,” in The Dictionary of Art, ed. Jane Turner, 34 vols. (New York, 1996), 5:164; Erling S. Skaug, Punch Marks from Giotto to Fra Angelico: Attribution, Chronology, and Workshop Relationships in Tuscan Panel Painting with Particular Consideration to Florence, c. 1330 – ​1430, 2 vols. (Oslo, 1994) 1:250; and Angelo Tartuferi, in Sumptuosa tabula picta: Pittori a Lucca tra gotico e rinascimento, ed. Maria Teresa Filieri (Livorno, 1998), 45. The most elaborate motivation for the dating is undoubtedly the one Steinhoff-­Morrison (1990) proposed, though her reasoning was based (in my view) on partially mistaken premises. We may agree with her when she declared that the San Cerbone polyptych was later than that formerly in the Museo di Santa Croce in Florence and the triptych from Fogliano now in the Pinacoteca Nazionale in Siena. But her proposal to link this latter altarpiece with a payment made in 1339 for a painting of similar subject executed for the Palazzo Pubblico in Siena was mere conjecture, nor does it seem to me that there are sufficient grounds to affirm, as did Steinhoff-­Morrison, that the biccherna panel of 1339 now in the Bibliothèque Nationale in Paris is earlier in date than the Fogliano triptych. Moreover, her observation, however subtle, that Bulgarini in the San Cerbone polyptych (and more precisely in the figures of Saint John and Saint Catherine) adopted “attributes [of the saints] as podia for their books” (Steinhoff-­Morrison, “Bulgarini, Bartolomeo,” 192) cannot lead to the conclusion that the motif derived from Pietro Lorenzetti. In particular, her claim that “the earliest known instance of this device is in the altarpiece of the Beata Umiltà in the Uffizi,” which was executed “by a pupil of Pietro Lorenzetti . . . ​probably . . . ​ca. 1340” (both, 192), is open to question. Apart from the fact that various reputable scholars recognize this important though unfortunately dismembered altarpiece (nos. 6120 – ​6126, 6129 – ​6131, and 8437 of the Uffizi in Florence, and nos. 1077 and 1077A of the Gemäldegalerie in Berlin) as a fully autograph work by Pietro Lorenzetti, Boskovits’s argument (1988) placing its date c. 1330 – ​1335 has not so far been repudiated. See Miklós Boskovits, ed., Frühe italienische Malerei: Gemäldegalerie Berlin, Katalog der Gemälde, trans. Erich Schleier (Berlin, 1988), 87 – ​89. It also should not be forgotten that Simone Martini, in his figure of Saint Mark in the Pisa polyptych (1319), had already used the motif in question by letting the lion support the Evangelist’s book. 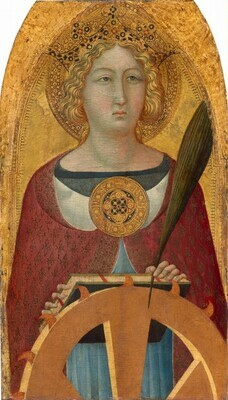 For a reproduction, see Pierluigi Leone De Castris, Simone Martini (Milan, 2003), fig. on 176. So there is no terminus post quem of 1340 for the saints of the San Cerbone polyptych. What these panels have in common is a quest for grandeur, simplification of form, and the expression of powerful emotion, in the spirit of works painted by Pietro Lorenzetti in his early maturity. Monastery of San Cerbone, near Lucca, by 1706 until no later than 1845; possibly Carlo Lasinio [1759–1838] or his son, Giovanni Paolo Lasinio [c. 1796-1855], Pisa; probably Monsignor Gabriele Laureani [d. 1849], Rome; Giulio Sterbini [d. 1911], Rome, by 1905; (Pasini, Rome). (Godfroy [sometimes spelled Godefroy] Brauer, Paris and Nice), by 1921; his estate; (sale, Christie, Manson & Woods, London, 5 July 1929, no. 29); half shares purchased by (Kunsthandel A.G., Lucerne) and (antique dealer, Amsterdam); sold 18 October 1932 to (Julius Böhler, Munich); sold 4 September 1937 to (Duveen Brothers, Inc., London, New York, and Paris); sold 1940 to the Samuel H. Kress Foundation, New York; gift 1943 to NGA. The church of San Cerbone near Lucca is mentioned for the first time in a document of 1059. Another document, of 1140, also records the Benedictine monastery annexed to the church. In 1234 the community of nuns assumed the Cistercian rule. They abandoned the monastery in 1442, when a community of Franciscan Observants was established in its place. See Enrico Lombardi, San Cerbone nella leggenda, nel culto e nell’arte, Massa Marittima, n.d. [c. 1970-1975]: 34-35. Antonio da Brandeglio (Vita di S. Cerbone Vescovo di Populonia e confessore, Lucca, 1706: 214-218) described the painting as extant in the chapel of the Madonna. Michele Ridolfi (“Sopra i tre più antichi dipintori lucchesi dei quali si conoscono le opere: cenni storici e critici,” Atti dell'Accademia lucchese di scienze, lettere ed arti 13 : 349-393) does not find the NGA painting; it was probably dispersed after the 1806 Napleonic suppression of religious orders. David Farabulini (La pittura antica e moderna e la Galleria del cav. Giulio Sterbini, Rome, 1874), who does not cite the painting now in Washington, states that the central nucleus of the Sterbini collection was formed of paintings collected by Monsignor Gabriele Laureani, custodian of the Biblioteca Vaticana from 1838 to 1849. Laureani is known for having acquired a large number of “primitives” for what is now the Pinacoteca Vaticana. Probably this prelate also collected paintings for himself and, following his death, his collection passed into that of Sterbini. It is also known that Laureani purchased Tuscan paintings of the fourteenth and fifteenth centuries from Carlo Lasinio, keeper/curator of the Camposanto in Pisa from 1807, whose collection was swollen in large part by paintings amassed at the time of the suppression of the convents in the early nineteenth century. It seems plausible to assume, therefore, that the panel now in the National Gallery of Art reached Rome through the intermediary of Carlo Lasinio (who in addition to being an engraver, is known to have been an art dealer as well as a collector) or his son Giovanni Paolo Lasinio (see Christopher Lloyd, “A note on Carlo Lasinio and Giovanni Paolo Lasinio,” The Bodleian Library Record 10 [1978-1982]: 51-57; Donata Levi, "Carlo Lasinio, curator, collector and dealer," The Burlington Magazine 135 : 133-148). For the paintings in the Biblioteca Vaticana with a provenance from the collection of Lasinio or his son through that of Laureani, see Wolfgang Fritz Volbach, Catalogo della Pinacoteca Vaticana. Vol. 2. Il Trecento. Firenze e Siena, Vatican City, 1987: 23, 24, 40; Francesco Rossi, Catalogo della Pinacoteca Vaticana. Vol. 3. Il Trecento. Umbria, Marche, Italia del Nord, Vatican City, 1994: 139, 142. Adolfo Venturi (“La quadreria Sterbini,” L’Arte 8 (1905): 422-440; La Galleria Sterbini in Roma, Rome, 1906: no. 6) first mentions the panel, together with two companion pieces now in the collection of the Pinacoteca Capitolina in Rome, as belonging to the Sterbini collection, but it had probably been there for several decades by then. After the collector’s death, at least part of the works formerly belonging to him passed to the Pasini collection in Rome (Raimond van Marle, The Development of the Italian Schools of Painting, 19 vols., The Hague, 1923-1938: 4:288, 378; 13:454 n. 1) and, possibly, to other collectors as well. Federico Zeri wrote to Robert O. Parks that Pasini was the dealer who sold the entire Sterbini collection; Parks in turn passed this information on to John Walker (letter, Parks to Walker, 27 December 1949, in NGA curatorial files). 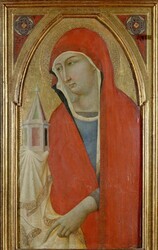 The painting was in Brauer’s collection at least by 20 May 1921, when the Paris office of Duveen Brothers describes it in a letter to their New York office: “A picture of ‘Saint Catherine,’ about 18 inches by 14, which he attributes to Ambrogio Lorenzetti.” The dimensions are more accurate in their description two years later (31 March 1923): “1 picture ‘St-Catherine of Alexandria.’ Pointed top. Gold background. Red cloak. Large gold plaque on breast. School of LORENZETTI. About 28 inches high.” Brauer died in December 1923, and Duveen Brothers remained in contact with his widow, Lina Haas Brauer (1868-1936), although they made no purchases from her. Duveen Brothers Records, accession number 960015, Research Library, Getty Research Institute, Los Angeles: reel 82, box 227, folders 26–28, and reel 115, box 260, folder 24 (copies in NGA curatorial files). Newspaper coverage of the 1929 sale, as well as an annotated copy of the sale catalogue (copies in NGA curatorial files), record Böhler as purchaser of the painting. Inventory card no. 164-32, in the Records of Julius Böhler Munich, Research Library, Getty Research Institute, Los Angeles (copy in NGA curatorial files), documents instead the 1932 purchase by Böhler and the half shares owned by the other dealers. The Lucerne and Munich firms, however, were intimately connected, as the Lucerne firm had been founded in 1920 by a son of the founder of the Munich firm. In 1930, Emilio Cecchi (Pietro Lorenzetti, Milan, 1930: 7) stated that the panel of Saint Catherine “è ora passata alla raccolta Ringling in Monaco.” Fern Rusk Shapley (Catalogue of the Italian Paintings, 2 vols., Washington, D.C., 1979: 1:271), as well as the prospectus assembled by Duveen Brothers (in NGA curatorial files), also speak of an otherwise unspecified Ringling collection in Munich. However, in view of the fact that the painting had been publicized as having been purchased by Böhler’s in Munich, the possible new owner was presumably the circus tycoon John Ringling (1866-1936), who is known to have used Böhler’s services in building up his art collection (now the Ringling Museum) in Sarasota, Florida, since the late 1920s. By 1930-1931, however, Ringling’s collecting had come to a rather abrupt halt as a consequence of the economic crisis (Peter Tomory, Catalogue of the Italian Paintings before 1800. The John Ringling Museum of Art, Sarasota, 1976: ix–xiii). Possibly for this reason the painting never in fact joined the rest of the Ringling collection. Instead, it must have remained in Europe, and Andrea Péter (“Ugolino Lorenzetti e il Maestro d'Ovile,” Rivista d'Arte 13 (1931): 2-44) also cites it as being with Böhler’s, whereas its two companion pieces were still in a private collection, presumably one of Sterbini’s heirs. It is noted in the 1929 newspaper coverage that Ringling was a purchaser at the sale, and perhaps because of this his name was linked with the painting by mistake. See the Böhler inventory card cited in note 5. The card also notes that the painting was first sold to Carl Hamilton in May 1937, but was then returned. Hamilton (1886-1967) was a client of Duveen Brothers; the dealer had offered him a large collection of Italian paintings on approval by 1920, but Hamilton did not purchase them and returned the paintings to Duveen the following year. An initial layer of paint applied to a ground that begins to define shapes and values. is visible in the shadows of the flesh tones. The paint was thinly applied, with long strokes that follow the contours of the form. The photograph in question, of which a copy is preserved in the photographic archive of the Kunsthistorisches Institut in Florence, was taken (according to a handwritten annotation) when the painting was with the dealer Julius Böhler in Munich. Brandeglio, Antonio di. Vita di S. Cerbone vescovo di Popolonia e confessore. Lucca, 1706: 221-222, 300. Ridolfi, Michele. "Sopra i tre più antichi dipintori lucchesi dei quali si conoscono le opere: cenni storici e critici." Atti dell’Accademia lucchese di scienze, lettere ed arti 13 (1845): 374. Venturi, Adolfo. Storia dell’arte italiana. 11 vols. Milan, 1901-1940: 5(1907):696 n. 1. Perkins, F. Mason. "Arte senese nella Quadreria Sterbini a Roma." Rassegna d’arte senese 1, no. 4 (1905): 148-149, as by Pietro Lorenzetti. Venturi, Adolfo. "La quadreria Sterbini in Roma." L’Arte 8 (1905): 427, 428 fig. 5. Venturi, Adolfo. La Galleria Sterbini in Roma: saggio illustrativo. Rome, 1906: 33-34, repro. 35. Jacobsen, Emil. Sienesische Meister des Trecento in der Gemäldegalerie zu Siena. Strasbourg, 1907: 41 n. 1. Vollmer, Hans. "Meister der Ovile - Madonna." In Allgemeines Lexikon der bildenden Künstler von der Antike bis zur Gegenwart. Edited by Ulrich Thieme and Felix Becker. 37 vols. Leipzig, 1907-1950: 37(1950):260. Crowe, Joseph Archer, and Giovanni Battista Cavalcaselle. A New History of Painting in Italy from the Second to the Sixteenth Century. 3 vols. Edited by Edward Hutton. Vol. 2, Sienese School of the Fourteenth Century; Florentine School of the Fifteenth Century. London and New York, 1908-1909: 2(1909):90 n. 7. Marle, Raimond van. The Development of the Italian Schools of Painting. 19 vols. The Hague, 1923-1938: 2(1924):326. DeWald, Ernest T. "Pietro Lorenzetti." Art Studies 7 (1929): 160 n. 2. Cecchi, Emilio. Pietro Lorenzetti. Milan, 1930: 7, pl. 8. Meiss, Millard. "Ugolino Lorenzetti." The Art Bulletin 13 (1931): 378 (repro. ), 380-384, 393, 397 n.
Perkins, F. Mason. "Pitture senesi poco conosciute." La Diana 6 (1931): 28. Péter, Andrea. "Ugolino Lorenzetti e il Maestro di Ovile." Rivista d’arte 13 (1931): 22-33, figs. 13-14. Campetti, Placido. "Annuari." Bollettino storico lucchese 4 (1932): 159. Edgell, George Harold. A History of Sienese Painting. New York, 1932: 114. Marle, Raimond van. Le scuole della pittura italiana. 2 vols. The Hague and Florence, 1932-1934: 2(1934):155, 160. Duveen Brothers. Duveen Pictures in Public Collections of America. New York, 1941: no. 14, repro., as by Pietro Lorenzetti. National Gallery of Art. Book of Illustrations. Washington, 1941: 133 (repro. ), 244. Preliminary Catalogue of Paintings and Sculpture. National Gallery of Art, Washington, 1941: 111, no. 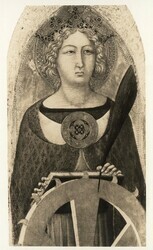 521, as by Pietro Lorenzetti. Book of Illustrations. National Gallery of Art, Washington, 1942: 250, repro. 135, as by Pietro Lorenzetti. Shoolman, Regina, and Charles E. Slatkin. Enjoyment of Art in America: A Survey of the Permanent Collections of Paintings, Sculpture, Ceramics & Decorative Arts in American and Canadian Museums: Being an Introduction to the Masterpieces of Art from Prehistoric to Modern Times. Philadelphia and New York, 1942: 284, pl. 253. Paintings and Sculpture from the Kress Collection. National Gallery of Art, Washington, 1945 (reprinted 1947, 1949): 20, repro., as by Pietro Lorenzetti. "The New Kress Gift to the National Gallery, Washington." The Burlington Magazine for Connoisseurs 86, no. 504 (1945): 56. Einstein, Lewis. Looking at Italian Pictures in the National Gallery of Art. Washington, 1951: 25 n. 1, as by Pietro Lorenzetti. Galetti, Ugo, and Ettore Camesasca. Enciclopedia della pittura italiana. 3 vols. Milan, 1951: 3:2482. Toesca, Pietro. Il Trecento. Storia dell’arte italiana, 2. Turin, 1951: 572 n. 92, 574 n. 93. Belli, Isa. Guida di Lucca. Lucca, 1953: 123-124. Paintings and Sculpture from the Samuel H. Kress Collection. National Gallery of Art, Washington, 1959: 29, repro., as by Pietro Lorenzetti. Summary Catalogue of European Paintings and Sculpture. .National Gallery of Art, Washington, 1965: 77. Shapley, Fern Rusk. Paintings from the Samuel H. Kress Collection: Italian Schools, XIII-XV Century. London, 1966: 53-54, fig. 145. Berenson, Bernard. Italian Pictures of the Renaissance. Central Italian and North Italian Schools. 3 vols. London, 1968: 2:347, pl. 67. Bertolini Campetti, Licia, and Silvia Meloni Trkulja, eds. Museo di Villa Guinigi, Lucca: la villa e le collezioni. Lucca, 1968: 142. European Paintings and Sculpture, Illustrations. National Gallery of Art, Washington, 1968: 68, repro. Fredericksen, Burton B., and Federico Zeri. Census of Pre-Nineteenth Century Italian Paintings in North American Public Collections. Cambridge, Mass., 1972: 133, 381, 646, 664. European Paintings: An Illustrated Summary Catalogue. National Gallery of Art, Washington, 1975: 200, repro. Torriti, Piero. La Pinacoteca Nazionale di Siena. I Dipinti dal XII al XV secolo. Genoa, 1977: 136. Bruno, Raffaele. Roma: Pinacoteca Capitolina. Bologna, 1978: 3. De Benedictis, Cristina. La pittura senese 1330-1370. Florence, 1979: 85, 86. Shapley, Fern Rusk. Catalogue of the Italian Paintings. National Gallery of Art. 2 vols. Washington, 1979: 1:270-271; 2:pl. 186. Il gotico a Siena: miniature, pitture, oreficerie, oggetti d’arte. Exh. cat. Palazzo Pubblico, Siena. Florence, 1982: 250, 457. Baracchini, Clara, ed. Il secolo di Castruccio: Fonti e documenti di storia lucchese. Exh. cat. Chiesa Monumentale di S. Cristoforo. Lucca, 1983: 199. L’Art gothique siennois: enluminure, peinture, orfèvrerie, sculpture. Exh. cat. Musée du Petit Palais, Avignon. Florence, 1983: 242. Skaug, Erling S. "Punch Marks. What Are They Worth? Problems of Tuscan Workshop Interrelationships in the Mid-Fourteenth Century." In La pittura nel XIV e XV secolo, il contributo dell’analisi tecnica alla storia dell’arte. Edited by Hendrik W. van Os and J. R. J. van Asperen de Boer. Bologna, 1983: 263. European Paintings: An Illustrated Catalogue. National Gallery of Art, Washington, 1985: 233, repro. Beatson, Elisabeth H., Norman E. Muller, and Judith B. Steinhoff. "The St. Victor Altarpiece in Siena Cathedral: A Reconstruction." The Art Bulletin 68 (1986): 628, n. 91. Castelnuovo, Enrico, ed. La Pittura in Italia. Il Duecento e il Trecento. 2 vols. Essays by Antonio Caleca and Monica Leoncini. Milan, 1986: 1:254; 2:560. Neri, Enrica. "Bulgarini, Bartolomeo." In Dizionario della pittura e dei pittori. Edited by Enrico Castelnuovo and Bruno Toscano. 6 vols. Turin, 1989-1994: 1(1989):475. Boskovits, Miklós, and Serena Padovani. Early Italian Painting 1290-1470. The Thyssen-Bornemisza Collection. London, 1990: 36, 37 n.13. Torriti, Piero. La Pinacoteca Nazionale di Siena: i dipinti. 3rd ed. Genoa, 1990: 90. Baracchini, Clara. "Lucca. Scultura, Pittura e Miniatura." In Enciclopedia dell’arte medievale. Edited by Istituto della Enciclopedia italiana. 12 vols. Rome, 1991-2002: 8(1997):21. Steinhoff, Judith B. Bartolomeo Bulgarini and Sienese Painting of the Mid-Fourteenth Century. 2 vols. Ph.D. dissertation, Princeton University, 1990. Ann Arbor, MI, 1991: 1:134, 135, 176, 192, 193, 215; 2:388-392. Labriola, Ada. "Bulgarini Bartolomeo." In Allgemeines Künstlerlexikon: Die bildenden Künstler aller Zeiten und Völker. Edited by Günter Meissner. 87+ vols. Munich and Leipzig, 1992+: 15(1997):109. Steinhoff, Judith B. "A Trecento Altarpiece Rediscovered: Bartolommeo Bulgarini’s Polyptych for San Gimignano." Zeitschrift für Kunstgeschichte 56 (1993): 107, 110, 111. Tazartes, Maurizia. "Profilo della pittura lucchese del Trecento." Ricerche di storia dell’arte 50 (1993): 90-91. Skaug, Erling S. Punch Marks from Giotto to Fra Angelico: Attribution, Chronology, and Workshop Relationships in Tuscan Panel Painting with Particular Consideration to Florence, c. 1330-1430. 2 vols. Oslo, 1994: 1:250; 2:punch chart 7.12. Steinhoff, Judith B. "Bulgarini, Bartolomeo." In The Dictionary of Art. Edited by Jane Turner. 34 vols. New York and London, 1996: 5:164. Filieri, Maria Teresa, ed. Sumptuosa tabula picta: pittori a Lucca tra gotico e rinascimento. Exh. cat. Museo Nazionale di Villa Guinigi, Lucca. Livorno, 1998: 45. "Bulgarini, Bartolomeo." In Dictionnaire de la peinture. Edited by Michel Laclotte and Jean Pierre Cuzin. Paris, 2003: 122. Strehlke, Carl Brandon. Italian Paintings, 1250-1450, in the John G. Johnson Collection and the Philadelphia Museum of Art. Philadelphia, 2004: 83 n. 4. Mori, Francesco. “Un polittico di Bartolomeo Bulgarini per la chiesa domenicana di San Gimignano.” In Capolavori ritrovati in terra di Siena: itinerari d’autunno nei musei senesi. Edited by Luciano Bellosi, Gabriele Fattorini, and Antonio Paolucci. Cinisello Balsamo (Milan), 2005: 86. De Floriani, Anna. "Pittura del Trecento fra Genova e Avignone: osservazioni in merito ad alcuni studi recenti e un’ipotesi ligure per il trittico di Angers." Studi di storia dell’arte 18 (2007): 41 n.15. Bellosi, Luciano, et al., eds. La collezione Salini: dipinti, sculture e oreficerie dei secoli XII, XIII, XIV e XV. 4 vols. Florence, 2009, 2015: 1(2009):113. Boskovits, Miklós, ed. The Alana Collection, Newark, Delaware, USA. Vol. 1 (of 2), Italian Paintings from the 13th to 15th Century. Florence, 2009: 1:43, 46, 47 n. 13. Boskovits, Miklós. Italian Paintings of the Thirteenth and Fourteenth Centuries. The Systematic Catalogue of the National Gallery of Art. Washington, 2016: 28-37, color repro. Click on any panel in the altarpiece reconstruction below to see an enlarged version of the image. Color reproductions in the reconstruction indicate panels in the National Gallery of Art collection. George Kaftal, Saints in Italian Art, vol. 1, Iconography of the Saints in Tuscan Painting (Florence, 1952), 225–234. Licia Bertolini Campetti and Silvia Meloni Trkulja, eds., Museo di Villa Guinigi, Lucca: La villa e le collezioni (Lucca, 1968), 141 – ​142. The Madonna measures 91 × 56 cm and the panel of Saint John the Evangelist 72.5 × 42.2 cm. According to Placido Campetti (1932), the monastery sold the two panels in the early years of the twentieth century. Placido Campetti, “Annuari,” Bollettino storico lucchese 4 (1932): 159. Raffaele Bruno, Roma: Pinacoteca capitolina (Bologna, 1978), 3. 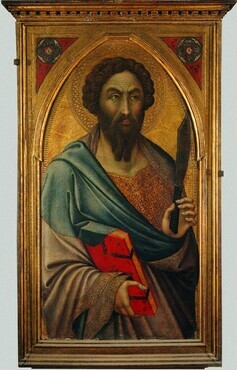 The panel of Saint Bartholomew (inv. no. 345) measures 75 x 42 cm, and that of Mary Magdalene (inv. no. 346) 73 x 41 cm. The two paintings entered the Capitoline collection, Rome, in 1936. I refer to such panels as the dispersed polyptych from the church of the Carmine in Siena, dated 1329, in which the laterals (representing full-length figures of saints) were each surmounted by an image of a pair of saints, or polyptych no. 50 in the Pinacoteca Nazionale of Siena, probably dating to c. 1335 – ​1340, in which the saints of the main register are represented half-length, though again with paired saints in the upper tier. Cf. Piero Torriti, La Pinacoteca Nazionale di Siena, vol. 1, I dipinti dal XII al XV secolo (Genoa, 1977), 97 – ​99, 105 – ​106. In contrast to the Carmine polyptych, the spandrels in polyptych no. 50 are decorated not with figures of angels but with ornamental motifs. One may recall the polyptych formerly in the church of Santa Croce in Florence, probably executed in c. 1330 and now divided among various museums in the world. Here the saints in the main register, portrayed just over half-length (and the angels filling the spandrels), are surmounted by a frieze of medallions with images of the ancestors of Christ and above that by paired saints; cf. Stefan Weppelmann, “Geschichten auf Gold in neuem Licht: Das Hochaltarretabel aus der Franziskanerkirche Santa Croce,” in Geschichten auf Gold: Bilderzählungen in der frühen italienischen Malerei, ed. Stefan Weppelmann (Berlin, 2005), 26 – ​50. Now in the Museo Nazionale di Villa Guinigi in Lucca; cf. Licia Bertolini Campetti and Silvia Meloni Trkulja, eds., Museo di Villa Guinigi, Lucca: La villa e le collezioni (Lucca, 1968), 139–140. Adolfo Venturi, “La quadreria Sterbini in Roma,” L’Arte 8 (1905): 427, 428 fig. 5; Adolfo Venturi, La Galleria Sterbini in Roma: Saggio illustrativo (Rome, 1906), 33–35; Adolfo Venturi, Storia dell’arte italiana, vol. 5, La pittura del Trecento e le sue origini (Milan, 1907), 696 n. 1. F. Mason Perkins, “Arte senese nella Quadreria Sterbini a Roma,” Rassegna d’arte senese 1, no. 4 (1905): 148 – ​149; F. Mason Perkins, “Pitture senesi poco conosciute,” La Diana 6 (1931): 28; Raimond van Marle, The Development of the Italian Schools of Painting, vol. 2, The Sienese School of the 14th Century (The Hague, 1924), 326; Emilio Cecchi, Pietro Lorenzetti (Milan, 1930), 7, pl. 8; George Harold Edgell, A History of Sienese Painting (New York, 1932), 114; Duveen Brothers, Duveen Pictures in Public Collections of America (New York, 1941), no. 14; National Gallery of Art, Preliminary Catalogue of Paintings and Sculpture (Washington, DC, 1941), 111; Regina Shoolman and Charles E. Slatkin, The Enjoyment of Art in America (Philadelphia, 1942), 284, pl. 253; National Gallery of Art, Paintings and Sculpture from the Kress Collection (Washington, DC, 1945), 20. Emil Jacobsen, Sienesische Meister des Trecento in der Gemäldegalerie zu Siena (Strasbourg, 1907), 41 n . 7; Edward Hutton, in Joseph Archer Crowe and Giovan Battista Cavalcaselle, A New History of Painting in Italy from the Second to the Sixteenth Century, vol. 2, Sienese School of the Fourteenth Century; Florentine School of the Fifteenth Century, ed. Edward Hutton (London and New York, 1909), 90 n. 7; Ernest T. DeWald, “Pietro Lorenzetti,” Art Studies 7 (1929): 160 n. 2. Andrea Péter, “Ugolino Lorenzetti e il Maestro di Ovile,” Rivista d’arte 13 (1931): 22–33; Millard Meiss, “Ugolino Lorenzetti,” The Art Bulletin 13 (1931): 380–384, 393, 397. Raimond van Marle, Le scuole della pittura italiana, vol. 2, La scuola senese del XIV secolo (The Hague, 1934), 155, 160. On the altarpiece, apart from the publication cited in note 12 above, cf. also Rudolf Hiller von Gaertringen, Italienische Gemälde im Städel 1300 – ​1550: Toskana und Umbrien, Kataloge der Gemälde im Städelschen Kunstinstitut Frankfurt am Main (Mainz, 2004), 82 – ​96. Since in May 1351 a carpenter received payments for “fattura civori e cercini e colonine di legname per la tavola di Santo Vittorio” (making awnings, curtains, and wooden columns for the altarpiece of San Vittorio), that is, for the embellishments to the polyptych’s wooden frame, it may be assumed that the work had already been completed by this date. Ever since his earliest works, such as the Madonna of Montichiello and the great Marian polyptych in the Pieve di Santa Maria at Arezzo (1320), Pietro Lorenzetti (Sienese, active 1306 - 1345) had proposed a more intimate and self-absorbed version of the group of the Madonna and Child, caught in affectionate rapport, turned towards each other and largely ignoring the spectator. 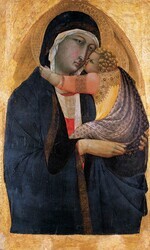 Subsequently, Pietro took this tendency one step further in such works as the Madonna formerly in the Serristori collection in Florence or that in the Museo d’arte sacra in Buonconvento where the child, in embracing his mother, even turns his back on the spectator. See Anna Maria Guiducci, Museo d’arte sacra della Val d’Arbia, Buonconvento (Siena, 1998), 28 – ​29. Neither these paintings nor comparable examples by Ambrogio Lorenzetti (e.g., the Madonna no. 39.546 in the Museum of Fine Arts in Boston or that in San Pietro di Castelvecchio in Siena), are securely datable, but their execution would seem to fall within the period c. 1335 – ​1345; cf. Luciano Cateni, “Un polittico ‘too remote from Ambrogio’ firmato da Ambrogio Lorenzetti,” Prospettiva 40 (1985): 62 – ​67. Although no exact Lorenzettian prototype is known for the composition proposed by Bulgarini in his altarpiece now in Lucca, the circumstance that Lippo Vanni (Sienese, active 1344 - 1376) adopted a very similar version of it in one of his youthful works (no. 1470, Städelsches Kunstinstitut, Frankfurt) probably implies the dependence of both paintings on a lost model of Pietro; cf. Rudolf Hiller von Gaertringen, Italienische Gemälde im Städel 1300 – ​1550: Toskana und Umbrien, Kataloge der Gemälde im Städelschen Kunstinstitut Frankfurt am Main (Mainz, 2004), 98 – ​106. Cf. Laura Martini, ed., Museo diocesano di Pienza, Musei senesi (Siena, 1998), 23–31. Andrea Péter, “Ugolino Lorenzetti e il Maestro di Ovile,” Rivista d’arte 13 (1931): 32; and Piero Torriti, La Pinacoteca Nazionale di Siena, vol. 1, I dipinti dal XII al XV secolo (Genoa, 1977), 136–137 had already noted these similarities in pose and physiognomic types. Cf. note 6 above. The greater linearity and expansive volume of the figure in the panel now in the Pinacoteca Capitolina suggest an earlier date for the Berenson Magdalene. Millard Meiss, “Ugolino Lorenzetti,” The Art Bulletin 13 (1931): figs. 18, 19; Andrea Péter, “Ugolino Lorenzetti e il Maestro di Ovile,” Rivista d’arte 13 (1931): fig. 1. Piero Torriti, La Pinacoteca Nazionale di Siena, vol. 1, I dipinti dal xii al xv secolo (Genoa, 1977), 134 – ​135. This is the painting that is likely closest stylistically to the San Cerbone polyptych. 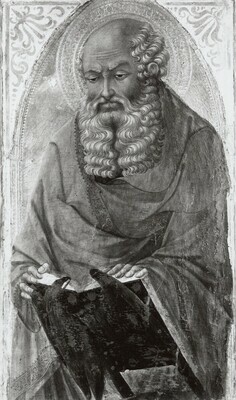 However, the daring invention in the latter, of presenting Saint John immersed in reading and with his face slightly foreshortened, though anticipated in the polyptych by Lippo Memmi (Sienese, active 1317/1347) at Casciana Alta near Pisa, should probably be considered an indication of a slightly later date for the Lucca panel. See Antonino Caleca, “Tre polittici di Lippo Memmi, un’ipotesi sul Barna e la bottega di Simone e Lippo, 1,” Critica d’arte 41 (1976): 49 – ​50. Brigitte Klesse, Katalog der italienischen, französischen und spanischen Gemälde bis 1800 im Wallraf-Richartz-Museum (Cologne, 1973), 65–66 (nos. 610–611). I refer to panels with trapezoidal termination and inner pointed arch with trefoil moldings, such as the Madonna by Simone Martini (Sienese, active from 1315; died 1344) at the center of the Orvieto polyptych (Museo Civico) or the panels of the dispersed polyptych by Lippo Memmi (on which cf. Saint John the Baptist). The panel by Niccolò di Segna dated 1336 formerly in the Pieve of Montesiepi must have been of similar type. See James H. Stubblebine, Duccio di Buoninsegna and His School, 2 vols. (Princeton, 1979), 2: fig. 477. In his first attempt to reconstruct the chronology of the artist’s catalog, Millard Meiss (1931) placed the San Cerbone polyptych among the master’s earliest works, close to 1330. Fern Rusk Shapley (1966, 1979) proposed a slightly later date of c. 1335, a dating that Antonio Caleca accepted (1981, 1986). Judith De Botton (1983) proposed 1340 – ​1350, Miklós Boskovits (1990) c. 1340, Judith Steinhoff-­Morrison (1990, 1993, 1996) the mid-1340s, Erling Skaug (1994) c. 1339 – ​1348, and Angelo Tartuferi (1998) c. 1340. See Millard Meiss, “Ugolino Lorenzetti,” The Art Bulletin 13 (1931): 376 – ​397; Fern Rusk Shapley, Paintings from the Samuel H. Kress Collection: Italian Schools, XIII–XV Century (London, 1966), 54; Fern Rusk Shapley, Catalogue of the Italian Paintings, 2 vols. (Washington, DC, 1979), 1:270 – ​271; Antonio Caleca, in Il secolo di Castruccio: Fonti e documenti di storia lucchese, ed. Clara Baracchini (Lucca, 1983), 199; Antonio Caleca, “Pittura del Duecento e del Trecento a Pisa e a Lucca,” in La Pittura in Italia: Il Duecento e il Trecento, ed. Enrico Castelnuovo, 2 vols. (Milan, 1986), 1:254; Judith De Botton, in L’Art gothique siennois: Enluminure, peinture, orfèvrerie, sculpture (Florence, 1983), 242; Miklós Boskovits and Serena Padovani, The Thyssen-­Bornemisza Collection: Early Italian Painting 1290 – ​1470 (London, 1990), 36, 37 n.13; Judith Steinhoff-­Morrison, Bartolomeo Bulgarini and Sienese Painting of the Mid-Fourteenth Century, 2 vols. (PhD diss., Princeton University, 1990), 1:192; Judith Steinhoff, “A Trecento Altarpiece Rediscovered: Bartolommeo Bulgarini’s Polyptych for San Gimignano,” Zeitschrift für Kunstgeschichte 56 (1993): 107; Judith Steinhoff-­Morrison, “Bulgarini, Bartolomeo,” in The Dictionary of Art, ed. Jane Turner, 34 vols. (New York, 1996), 5:164; Erling S. Skaug, Punch Marks from Giotto to Fra Angelico: Attribution, Chronology, and Workshop Relationships in Tuscan Panel Painting with Particular Consideration to Florence, c. 1330 – ​1430, 2 vols. (Oslo, 1994) 1:250; and Angelo Tartuferi, in Sumptuosa tabula picta: Pittori a Lucca tra gotico e rinascimento, ed. Maria Teresa Filieri (Livorno, 1998), 45. The most elaborate motivation for the dating is undoubtedly the one Steinhoff-­Morrison (1990) proposed, though her reasoning was based (in my view) on partially mistaken premises. We may agree with her when she declared that the San Cerbone polyptych was later than that formerly in the Museo di Santa Croce in Florence and the triptych from Fogliano now in the Pinacoteca Nazionale in Siena. But her proposal to link this latter altarpiece with a payment made in 1339 for a painting of similar subject executed for the Palazzo Pubblico in Siena was mere conjecture, nor does it seem to me that there are sufficient grounds to affirm, as did Steinhoff-­Morrison, that the biccherna panel of 1339 now in the Bibliothèque Nationale in Paris is earlier in date than the Fogliano triptych. Moreover, her observation, however subtle, that Bulgarini in the San Cerbone polyptych (and more precisely in the figures of Saint John and Saint Catherine) adopted “attributes [of the saints] as podia for their books” (Steinhoff-­Morrison, “Bulgarini, Bartolomeo,” 192) cannot lead to the conclusion that the motif derived from Pietro Lorenzetti. In particular, her claim that “the earliest known instance of this device is in the altarpiece of the Beata Umiltà in the Uffizi,” which was executed “by a pupil of Pietro Lorenzetti . . . ​probably . . . ​ca. 1340” (both, 192), is open to question. Apart from the fact that various reputable scholars recognize this important though unfortunately dismembered altarpiece (nos. 6120 – ​6126, 6129 – ​6131, and 8437 of the Uffizi in Florence, and nos. 1077 and 1077A of the Gemäldegalerie in Berlin) as a fully autograph work by Pietro Lorenzetti, Boskovits’s argument (1988) placing its date c. 1330 – ​1335 has not so far been repudiated. See Miklós Boskovits, ed., Frühe italienische Malerei: Gemäldegalerie Berlin, Katalog der Gemälde, trans. Erich Schleier (Berlin, 1988), 87 – ​89. It also should not be forgotten that Simone Martini, in his figure of Saint Mark in the Pisa polyptych (1319), had already used the motif in question by letting the lion support the Evangelist’s book. 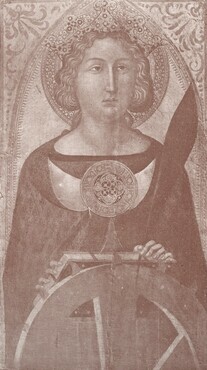 For a reproduction, see Pierluigi Leone De Castris, Simone Martini (Milan, 2003), fig. on 176. So there is no terminus post quem of 1340 for the saints of the San Cerbone polyptych. Photographs made during Pichetto’s treatment (in NGA conservation files) show the painting still in its rectangular shape, but with the top edge cut down. The NGA scientific research department analyzed the spokes using x-ray fluorescence spectrometry (XRF). Traces of silver were found in all but one spectra (analysis completed March 3, 2014, report forthcoming). Antonio di Brandeglio, Vita di S. Cerbone vescovo di Popolonia e confessore (Lucca, 1706), 221 – ​222, 300, reported a renovation of the chapel of the Virgin in the church of San Cerbone in 1669, during which the Washington panel and its companions (see below) were given a “more decent framing.” Evidently the reframing entailed the truncation of the upper part of the arched termination in all panels. Venturi published a photograph by the Danesi studio (Rome) in 1905 and 1906; here the panel is shown virtually in the same state as in photo no. E – ​3562 of the Istituto Centrale per il Catalogo e la Documentazione in Rome. This latter was probably made in the same year. See Adolfo Venturi, “La quadreria Sterbini in Roma,” L’Arte 8 (1905): 427, 428 fig. 5; Adolfo Venturi, La Galleria Sterbini in Roma: Saggio illustrativo (Rome, 1906) 33 – ​34, 35 repro.